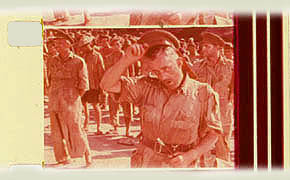 Here are stills from an original 16mm print of the 1957 feature film 'BRIDGE ON THE RIVER KWAI' printed on Fuji colour stock. 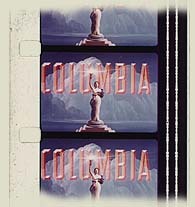 The Fuji clip shown on the left has retained strong blues, greens and yelows. 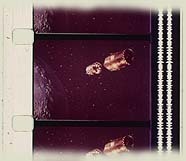 The clip above and still frame below show typical Eastmancolor. 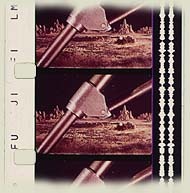 Worn sections of this television print were renewed with replacement sections printed on Fujicolor film stock. Over years the Eastmancolor has turned while the Fuji sections remain relatively unfaded. 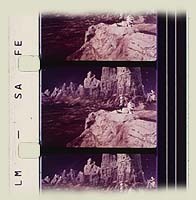 These frames shown below are from a Fujicolor print of 'First Men in the Moon' (1964) dated 1972 showing colour fade after forty years. While the colour has shifted to the red, the colours have proved to be more stable than Eastmancolor.